year-round protection of your equipment and/or instrumentation. Corrosion resistant materials of construction for long life. Insulated to reduce heating/cooling costs. available to meet your requirements. Fast delivery on many sizes. equipment for a wide variety of applications such as: Peaked roof with two (2) cadmium plated lifting eyes. (O.I.C.) - see door construction/hardware. flange, predrilled for 1/2" diameter anchor bolts. Closed cell neoprene rubber base mounting gasket. Smooth white isophthalic gelcoat finish containing U.V. class 1, flame resistant foam insulation. and EFC-54x___-1) is 36" wide x 78" high (O.I.C.). of .14 BTUin/hr•ft• °F and an R-value of 7.1. #EFC-72x___-2 are 63" wide x 78" high (O.I.C.). Door frame is integrally molded within front wall. White isophthalic gelcoat finish on interior surface. A. Exterior FRP laminate with gelcoat finish, min. 1/8" thick. E. Neoprene sponge rubber gasket (weather-stripping). F. Continuous stainless steel piano hinge. & ceiling. G. Plated cane bolt for passive door. H. Astragal (Z-bar style) for passive door. C. Interior FRP laminate with gelcoat finish, min. D. Integral FRP door frame. 1. Cadmium plated lifting eye - two (2) provided 5. Stainless steel cylindrical lockset. 2. Plated safety stop chain. 6. Plated cane bolt for passive door. 3. Plated chain bolt for passive door. 7 Neoprene rubber base wiper gasket. 4. Continuous stainless steel piano hinge. A. Exterior FRP laminate with gelcoat finish, min. 1/8" thick. B. 1" thick polyisocyanurate foam insulation in walls & ceiling. C. Interior FRP laminate with gelcoat finish, min.1/16" thick. D. 4" wide x 1/4" thick integral FRP base mounting flange. E. 9/16" diameter predrilled hole for anchor bolt. Model # and size of building. 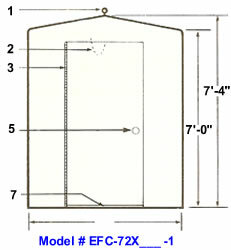 Door swing (for models #EFC-72x___-1 and EFC-54x___-1). 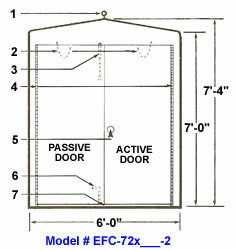 Active/passive door position (for model #EFC-72x___-2). Optional equipment items - please furnish drawing detailing locations. Model # Wide x Deep x High Basic Wgt. 1. 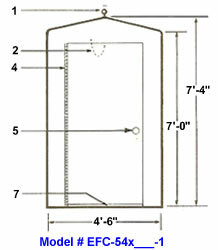 Above sizes are overall exterior dimensions. 2. Depth dimension is available in nonstandard sizes. 3. Standard overall wall thickness is 1 1/4". 4. Standard eave height is 7'-0".